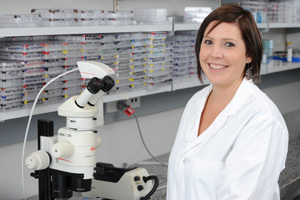 The winner of the 2010 Victorian Premier’s Award for Health and Medical Research is an Australian Synchrotron user whose work is helping to provide new insights into organ transplant rejection. Julia Archbold received the $16 000 award for her PhD research on the role of immune system proteins in organ transplantation, which she conducted under the supervision of Professor Jamie Rossjohn in the Monash University School of Biomedical Sciences. Julia's research helps explain why patients’ bodies may reject transplants of donor-recipient matched organs. She discovered that the three-dimensional structures of immune proteins called major histocompatibility complex (MHC) molecules, along with their corresponding T-cell receptors, can be used to help predict whether organ rejection will occur. MHC molecules and T-cell receptors play important roles in enabling our bodies to recognise whether particular proteins belong to us or whether they are foreign and should therefore be attacked by our immune systems. In simple terms, the MHC molecules present the proteins for assessment by the T-cell receptors, which can call in the rest of the immune system if required. Each person’s T-cell receptors are educated to interact with certain MHC molecules. If the MHC molecules in the donor organ have a different structure from the recipient’s MHC molecules, the recipient’s T-cell receptors can't recognise them and won't mount an immune response to destroy the transplanted tissue. Although this work is still in the preliminary stages, it could eventually lead to the development of a structural database of MHC molecules, which could be combined with existing tissue typing strategies to identify suitable donor-recipient 'mismatches' for organ transplantation. Around 1700 Australians are currently waiting for donor organs. Julia used the Australian Synchrotron macromolecular crystallography beamlines MX1 and MX2 for her x-ray crystallography studies and collaborated with researchers from the University of Melbourne and Queensland Institute of Medical Research during her PhD. Julia is currently in Auckland, NZ undertaking a postdoctoral position in Ted Baker’s laboratory at Auckland University. She has a National Health and Medical Research Council overseas training fellowship and will return to Australia in 2012. Link to Monash University news item.